Maximum Ridge Height : 24'10"
The steep-pitched roof, suggestive of an A-frame, triggers the rustic getaway mood of this vacation/recreation house. 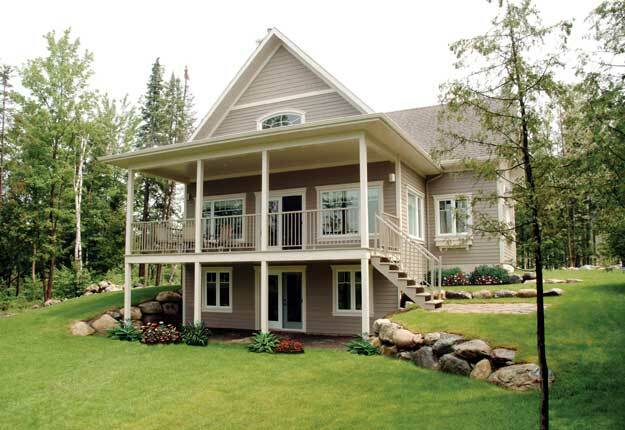 Double porches with pillars grace the exterior. Indoors, large windows and sidelights draw the natural light and amplify the view. The spatially rich layout encompasses two levels. A cathedral ceiling crowns the family room with fireplace and open dining area. The country-style kitchen includes the convenience of a raised eating bar. The master bedroom's amenities include an enormous walk-in closet and full bath. Upstairs, the secondary bedroom adjoins the mezzanine living area and full bathroom; the mezzanine offers an aerial view of the family room.